As we all are well aware, Kappa Alpha Psi affords Brothers several opportunities to enjoy each other’s company in a bond of fellowship. The good brothers of the New York Alumni Chapter, have taken that idea, and taken that opportunity to share in that “Good ole’ Kappa Spirit” and take their fellowship opportunities on the road. The Annual NYA Miami Fellowship trip, now in its 5th year continues to grow and capture the interest of not just our younger chapter brothers, but some of us “middle aged brothers” as well! Brothers of the chapter are presently in talks to make a trip to The Dominican Republic, just for a change of scenery. During this time, brothers will have the opportunity to just relax and enjoy the “Bond” and strengthen the ties of fraternity and brotherhood that they share with one another. At New York Alumni – we are a chapter that works very hard in planning and executing our community service initiatives – and we also take time out to truly just be brotherly as well. On Friday, May 16th, Brothers of New York Alumni travelled to Westchester County to attend Eta Eta Omega Chapter of Alpha Kappa Alpha’s Annual Scholarship and Dinner Dance at The Pelham Country Club. It served as a wonderful opportunity for us to mix and mingle with differentchapters of AKA’s, Alphas and Omegas that were in attendance. Through these meetings, we have started preliminary discussions regarding partnering on future events. New York Alumni was present at the Eta Nu Sigma Chapter of Sigma Gamma Rho’s Golden Mother’s Day Brunch. Some of us even brought our Mothers and significant others to share in the fun and festivities – showing true support. With the culminating event being the 24th Annual NPHC Founders Day Program with its theme:”One NPHC: Ensuring Excellence of Our Members and Community Through Education, Collaboration and Advocacy”, which was held at Friendship Baptist Church. In Harlem The Keynote Speaker was Jersey City Alumni’s own Brother L-Mani Viney – National Guide Right Chair of Kappa Alpha Psi Fraternity, Incorporated. It was at this event that our NYA Brother Sean Carswell received the Frater of the Year Award. NEW YORK ALUMNI WAS AT EVERY BBQ THIS SUMMER!!! Brothers of NYA took every opportunity to fellowship this summer. From Brother Barr’s annual BBQ in Brooklyn, To The Atlanta Greek Picnic, Nupe Jerzey, Polemarch Bobb’s NU PSI BBQ, and The Turnpike BBQ in Philadelphia, NYA really showed up and showed out all across Kappa-Land!!! The New York Alumni Chapter set out to renew the ties that they have within the city’s Greek life as we began a new fraternal year. On September 20th , we attended the Whitney Young Classic and fellowshipped with our Brothers in Kappa under the NEP Tent. We also visited other locations within the stadium’s parking area to fellowship with our fellow Fraters and Sorors from the other “Divine 9” organizations. New York Alumni participated in the African American Day Parade this year in large numbers. On September 21st, 2014 Our newer initiates got the crowd involved by doing their “Shimmy” all the way up the parade route of 7th Avenue. At the conclusion of the parade, all participants and well-wishers alike were invited to the Kappa Kastle to relax, refresh themselves from the long walk uptown, and fellowship with the “Nupes of NYA”. On Saturday, October 4th The Brothers of New York Alumni Hosted Senior Grand Vice Polemarch Thomas Battles while on his speaking tour to New York City. Our Good Brother Rev Dr. Calvin O. Butts allowed him to speak with us at the historic Abyssynian Baptist Church. Afterwards, we all headed back to the Kappa Kastle to fellowship. Also on the night of October 4th, The Brothers of NYA attended Pi Kappa Omega Chapter of Alpha Kappa Alpha’s “End of Summer Soiree” at Chelsea Piers in Midtown Manhattan. On October18th, Brothers of the chapter made a journey to Howard University for Howard Homecoming. While there, they enjoyed the Bond of Cherished Brotherhood” as they mixed and mingled with Brothers from all over the east coast that came out to be on Xi Chapter’s “yard” for the homecoming celebration. On Friday, October 31, 2013 New York Alumni partnered with the National Step Team of La Mermandad De Sigma Alpha Iota to host the “Tales From The Krypt – Legend of the Unicorn” costume party at Tequa lounge in lower Manhattan. Our annual Halloween costume party is an event that we have hosted in the past with other “special guest sororities”. Every year the crowd continues to increase due to the diversity of the groups that we partner with. Everyone comes out and has a great time, and the costumes become more elaborate and very well thought out. The event served to be a wonderful way to expand our “Kappa Brand” to another Greek letter organization that is not a part of the Divine Nine community. Brothers of the New York Alumni Chapter, as per good compliance and in the spirit of fraternity, attended the annual C. Rodger Wilson Leadership Conference this past November, All officers attended in order to certify themselves as per the mandates of the Northeastern Province and to handle the business of Kappa. Over the course of those past few months, we still managed to maintain our “Fraternal Family” obligations in regards to The Pan Hellenic Council. We have attended meetings regularly, and also assisted in hosting last year’s NPHC Anniversary Weekend where our Good Brother Sean Carswell won “Frater of the Year. On December 27th , in the spirit of “Greekdom”, we donated the Kappa Kastle to the National Pan Hellenic Council of Greater New York (NPHCGNY), to host their annual holiday party. You would figure that after the very busy holiday season of community service initiatives we just put behind us, New York Alumni would be exhausted but instead, we doubled our efforts to take the lead in this year’s J5 Founders Day activities. NYA’s Fundraising Team negotiated the deals with the venue for bar guarantees and bottle service for the J# Party on Saturday, and then opened up the doors of the Kappa Kastle on January 5th, for a wonderful Founder’s day experience with our Brothers from all over the world of Kappa. On January 17th, 2015 The New York Alumni Chapter was out in large numbers to attend “The New York Metro Area Founders Day Celebration”. We are proud to say that we had such a large contingent that travelled out to the event with us. While there we were able to meet with Brothers that we hadn’t seen in a while and reminisce on the good times that we have shared within the bond. We awarded Brothers Barr, Brown and Duncan – very deserving Brothers that afternoon, for services to the chapter, that we consider to be exemplary. We also paid homage and thanks to Senior Member Austin Powlis on his recognition as one of the brave men to storm the beaches of Normandy in World War II. On Saturday, February 2nd, The Northern Manhattan Alumni Chapter (NMAC) of Delta Sigma Theta Incorporated held their annual Black History Month Dinner program called The Art & Power of Storytellers III: A Tribute to Our Black Families. The theme of the event payed tribute to families of African descent who identify by any name…American, Caribbean, Latino, Black, Light-Skin, Dark-Skin for as a collective people we are more than a name – we are a village. The awards program was hosted by NYA Brother Sean Carswell and NMAC Soror Monique Carswell. They shared with the audience their story of how they met and their families. NMAC held a “Tell Your Story” contest where contestants wrote to NMAC to tell them their story of black Family. Awardees included Adémola Mandella, Judith Michelle Hill, Sonya Tennell. Adémola Mandella has been a pioneer in the natural hair care industry for nearly 30 years. His vision produced two of the premier natural hair care salons in New York City: KINAPPS African Groomers™ and LOCKS N’ CHOPS HAIR™.Judith Michelle Hill and Sonya Tennell. She is a digital storyteller and animator. JMichelle teaches computer graphics at “The New School” in New York City. She is using her newly acquired skills in animation to pay tribute to her mother. Sonya Tennell began her professional career at the Bronx County District Attorney’s Office, where her sense of responsibility and accountability served her well as an Assistant District Attorney. She was responsible for structuring cases from inception to trial, which included tasks such as interviewing and preparing witnesses, jury selection, and providing oral arguments and written briefs. This February, we are continuing to support Brothers and Organizations up to the very last minute of this submission. February 17th, 2015 – LAST NIGHT!!! Last night Brothers of NYA went to see Brother Ryan Johnson perform his one man show entitled “ We Lost Ourselves”,at Taj Restaurant And Lounge in lower Manhattan. We support our Brothers of Queens Alumni as they partner with the Eta Nu Sigma Chapter of Sigma Gamma Rho Sorority for the return of their “Drunk In Love Post Valentine’s Day Mixer. It is indeed a pleasure to be able to support and participate in the functions of our Greek letter organization peers. It’s a difficult job – but the Brothers of the New York Alumni Chapter are committed to making long lasting relationships within ALL of the different circles that we travel in. 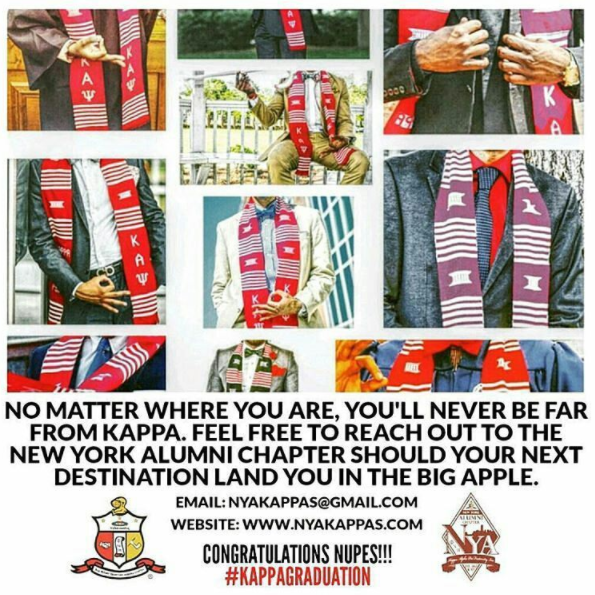 The New York Alumni and The Bronx Alumni Chapters of Kappa Alpha Psi, share a unique history. Both chapters were chartered on February 20th. New York Alumni was chartered in the year of 1937 and The Bronx, in 2009. We have established a tradition over time that will become historic, as we host our Joint Charter Day festivities together. It was our dear past Polemarch Emeritus, Oliver W. Parson that relayed the spirit to us to have a joint dinner where we break bread as Brothers in the Bond. On Friday February 20th, our actual Charter Date, we will have a small reception at the Kappa Kastle, followed by a small gathering of friends and well – wishers from other organizations. It’s great for inter chapter relations between the two chapters, and great for Kappa Alpha Psi.